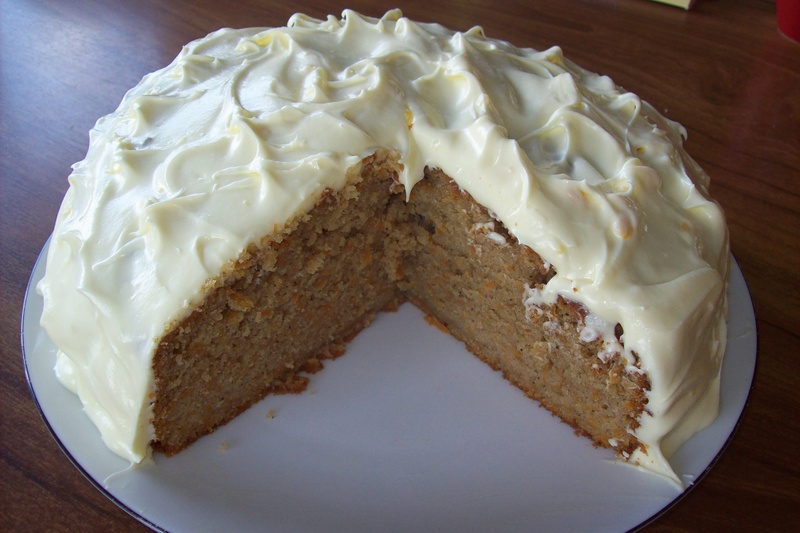 Today I made this particular carrot cake for three very good reasons. I dont have any white sugar in the house. I have a tub of sour cream that needs to be used pronto. I haven’t made carrot cake for at least a week month year. This carrot cake is a lighter one. I don’t mean light in calories though… light in texture. I used to have a very good recipe for a microwave carrot cake that had a whole tin of crushed pineapple in it. Unfortunately, when I sold my microwave before leaving Australia I gave them the instruction book with it… which had the recipe inside! I have recently been given a couple of similar recipes but I have to test them first. Sift flour and spices into a bowl. Stir in the brown sugar and break up any clumps. Add grated carrot. In another bowl mix eggs, sour cream and oil until combined. Add wet ingredients to the flour and carrot mixture and mix until well combined. Spoon into prepared tin and smooth the surface. Bake for 1 hour and 15 minutes or until a skewer comes out clean. Leave in the tin for 10 minutes then turn it out onto a wire rack to cool completely. Cover with your favorite cream cheese frosting and devour! 1. I love frosting my cakes exactly in that manner. Piped frosting is too fussy! 2. You say it’s light in texture and it’s rare I find a carrot cake light in texture. I don’t know why but I’ve never made carrot cake before. Crazy!